Sometimes you may like keeping all your files in WMV format as it can be played smoothly in Windows Media Player. To convert MP3 to WMV format, you’ll want to select a fast and easy way, as different settings may lead to totally different results. We will share best website to convert MP3 to WMV online and best software to convert MP3 to WMV on desktop in the following article. Check it out. KeepVid Online Video Converter is a newly developed website by KeepVid, which has ten years’ experience in multimedia field. This online video converter website enables you to convert MP3 to WMV easily. There are 50 formats supported by KeepVid online video converter, so you can find almost all popular video and audio format on this website. With the help of this online video and audio converter, you can even convert files to lower quality for taking small size in your device. 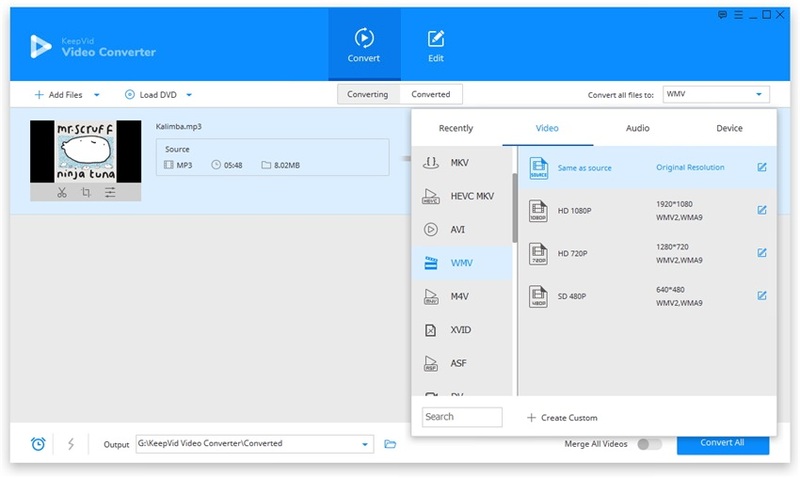 In fact, you can also convert WMV to MP3 with easy steps by using KeepVid video converters. The solutions can help you to get the work done in very short time. KeepVid Video Converter is a converter program for desktop and it’s much more powerful than the online video converter. This video converter program can help you to convert videos to more than 1000 video and audio formats. If you want to enjoy videos on your device, or watch a movie with better visual experience, then this video converter is a good choice. While using this converter program to convert MP3 to WMV format you can easily edit the file before conversion. The following part will show you how to use this video converter to convert MP3 to WMV. Convert MP3 and other files to more than 1000 video and audio formats. Allow users to edit videos before conversion with the trimming, cropping, and adding effects features. Download videos from more than 10000 video sharing sites. Convert videos with 30x faster converting speed than any other video converters. Step 2. Select WMV as an output and click Convert button to start converting MP3 to WMV. Download and install KeepVid Video Converter on your computer, then start it. After that, you’ll need to choose the Convert section at the top middle of the main interface. Click the Add File button or Add Folder button to add the MP3 file from your computer. The program also enables you to drag and drop the video into the program window directly. The program will load the detailed information of this MP3 video. Now you can click the inverted triangle beside the Target area, and choose WMV as an output in the pop-up dialog. Also, you can click the inverted triangle beside the Convert all files to button, and select WMV as output format. After that, you can click the Convert or Convert All button to start converting MP3 to WMV. 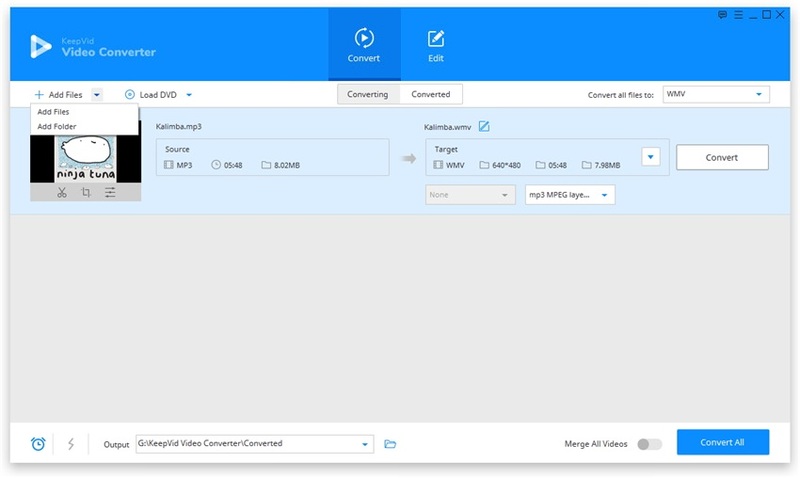 KeepVid Video Converter will show you the progress of MP3 to WMV conversion. When the conversion finishes, you can go to the Converted tab, and locate your converted file. You can also right-click the converted file and choose Open File Location to find the converted file in your computer. Windows Media Video is the full name of WMV format. This format was developed by the Microsoft 2003 but got approved in 2006. The main competitors of this format are MPEG-4, MPEG-4 ASP, RealVideo and AVS formats. This is a container format so it can easily hold the audio and video both type of files in a single file. This format was developed in the competition of Real Video to play files on the internet streaming sites.